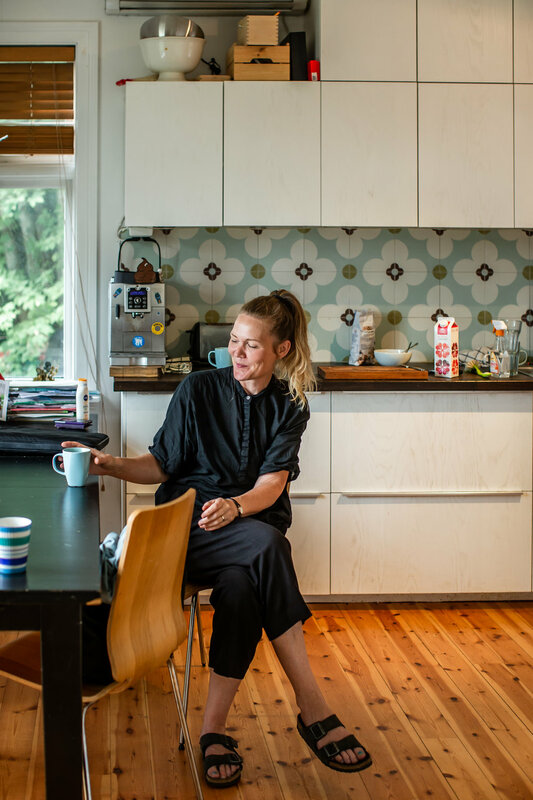 We visited Kjersti at her beautiful and lively home in Bergen center at the end of the summer. She invited us to take a look at her art collection including an amazing mural covering most of the living room. The art works fit naturally into the home, complimented by both original architectural details, the Bergen skyline outside, family portraits and children´s artworks. A+F: Can you say a little about yourself and your connection to Bergen? KS: I was born and bred on the other side of the mountain. Growing up in the countryside was a little bit boring, there wasn´t much happening. So I wanted to go out and explore the world. So I did all my education in England. I came back to Oslo in ´96 and was part of an artist collective, called Atelier 69, in Brenneriveien. It was a beautiful spot, an old print factory that we rented so we had massive studios and a project space in the middle. I went back to England to do my MA, this was prior to the BA, MA system in Norway, I thought it would be most natural to do everything in England. So I went back to study at the Royal College of Art. My connections at that time were in Oslo as I had close relations there and a boyfriend. So I was commuting between London and Oslo and that was my network. I got to know an interesting group of artists based in an old apartment building in Grünerløkka. That was a place with a lot of musicians, filmmakers and artists and they were very open and included me. That was the time that I started to work with a gallery based in Oslo. I returned to Oslo after my MA and did what was called the 5th year at Oslo, an extra year at the academy with facilities. Then like many Norwegian artists, I travelled to Berlin for some time. I met my partner Eirik in Bergen during the Christmas holidays. So I came back because of love and my family was also here so it was very practical. A+F: How did you become an artist? How did your interest in art develop? KS: I think it was because of my family, it was a classic case. My father was an architect and a brilliant drawer and I wanted to be even better than him. It seemed completely natural to become an artist, it felt like my only option in a way. It sounds very strange to say that in later life, to have made that decision. Later you have all the nuances and understand all the difficulties of the artist life. The idea started when I was 6 or 7, drawing was a big interest for me. I started as a painter, painting and drawing during my bachelor and I started in the painting department at the Royal College. A+F: When did you make the switch into your current time based media practice? KS: That happened in Oslo, there was a very exciting mix of people connected to the artist run space I was working in. Music has always been a very strong interest for me too, and there just felt like there was more of me in the time based media. It was more flexible. Also the problems transporting and storing my huge paintings when I moved was a motivating factor! A+F: Tell me what it’s like to be an artist in Bergen? How does it compare to other cities or countries you have worked? You were working in capital cities before, how did you adapt to moving here. KS: When you are in love you are temporarily insane. I didn´t think about how the move would impact my career at the time. Because Oslo had both the alternative art scene and the commercial gallery, I was very anchored there. When I came to Bergen I was thinking with my heart. For the first years here I had my kids, so I was a bit out of the art scene. It´s hard to re-establish yourself. The networks you build have many strata of friends, colleagues, the context that you work in. When you have a gap like that it´s hard to rebuild. It´s more the break in lifestyle which creates problems. I was however, lucky to get work at the art academy here, that gave me great contacts with staff and students, also the chance to invite interesting artists to guest teach. I also found a great studio in M17 in Møllendahlsveien and met great artists there. The first phase in getting established was my connection with my friend Torunn Skjelland who helped me find my studio, the job came after that. I have one of her paintings in the hall. A+F: Tell me a bit about the artworks you have from other artists? How do you come to own these pieces? KS: They are all from friends, most of them were exchanges. The big wall painting was a wedding gift from Torunn Skjelland and Vigdis Fjellheim. The treehouse I bought, Andreas returned to Malmø and left it in the studios as he couldn´t transport it, so I took the opportunity to buy it as I liked it so much. A+F: You were with a commercial gallery for some time. What is your experience with selling works? KS: It was a little complicated, I found it difficult to make works with the intention of selling. If you work with videos, you end up selling stills and drawings but it´s easy to feel like your priorities are in the wrong place while creating the work. A+F: It´s interesting that you started selling work exactly when you shifted from painting, which is more commercially viable, to video. KS: It was strange timing, but I was lucky to have contacts with one curator in particular who was very interested in video works. The gallery didn´t expect me to sell a lot but they showed my video work and supported that. I have artworks people have bought that occasionally surface. There are some pieces which are in public spaces, private homes and companies which were bought back then. It´s strange to see them again as after such a long time I have a distance to them. They are living their own lives out in the world. A+F: How do you choose the art you live with? KS: Torunn´s painting in the hall was a swap with a drawing. Nora´s (your) photograph here was a gift, I saw it in another home and liked it. Swapping is great but needs to be done with sensitivity so that everyone is happy in the end. The wall painting was a gift, the artists knew me well and knew I have a thing for this green colour and I have quite a few of my own works with this green wash. They included elements from mine and Eirik´s life and motifs from the view from the window. The shore line has completely changed since this was painted in 2011. A+F: I like the fact that your home is such an active place, full of life. The children´s drawings are mixed with the artists works. Have there ever been things that you have wanted to buy but haven´t had the chance yet? KS: There have definitely been things that I wanted to buy, but of course I don´t have a budget to buy artworks. It is also a hard worn house at the moment, there is so much activity that there are definitely things I wouldn´t bring in here now. A+F: Where is your studio now? How do split your time between earning money, studio work and home? Now I am a research fellow at KMD, midway through the project. I have sublet my own studio for these years and am based in the school at the moment. The fellowship is not just studio time, there is also the reflection part, writing, reading, presentations, discussions, it is very intense, it´s like a marathon, it´s a 3 year program, which is much longer than the normal span of a project, preparing for an exhibition for example might normally be a one year process. It´s a 100% job which is a luxury situation, still, to manage the process is a lot mentally, you have to be disciplined. A+F: Could you tell us how a typical day looks like for you? Do you end up working from home too or do you manage to separate your studio and free time? KS: Because of the family I work during the day, then I walk the dog and then facilitate all the family activities in the evening. When the children are in bed, if I have energy I will do some of my reading or continue working. I had hoped I could be more social during the program but it has been hard to find the space. I do work in collaborations a lot with different people, so that in a way fills some of that social gap. You have to train yourself not to feel guilty about not participating more in events and exhibition openings because it´s just not possible to do everything, there are only 24hours in the day. A+F: So of course you are working on the fellowship now, do you have projects and exhibitions coming up? KS: I had an exhibition at TagTeam last September in collaboration with you, as you know Nora, and we will perform the piece for a second time at the symposium on Feminist Hauntologies organised by the The Center for Feminist Research, London, at St James Hatcham church, Goldsmiths University, in Februrary, 2019. I will exhibit the culmination of my fellowship work at Kunsthall 3,14 January 2020. The final presentation of the artistic research project at Kunsthall 3,14 makes use of speculative questions. The works in the exhibition are situated in the specific historical point of discovery of the electromagnetic spectrum that curiously resonated into the development of subliminal psychology studies and psychical research. The exhibition draws on the marginal and occluded history of subliminal and psychical research to explore concepts on how human made electromagnetic radiation and the earth's electromagnetic radiation seem to interweave and coagulate, and to resurface as fissures, or spectres in our language and perception. Once a month, ART + FOLK will introduce someone from our local art community. We will open the doors to their home or to their studio and have them tell us a bit about their everyday, their work and what they have on their own walls. Interview by Nora Adwan; photos by Tove Lise Mossestad. This project is supported by the City of Bergen (Bergen Kommune) and Arts Council Norway (Norsk Kulturrådet).